Stokely Carmichael’s cry for Black Power in ’66 was a cry of frustration. It did not have planning behind it, and in some ways I feel Stokely — whom I loved, whom I liked a good bit personally in 1960 when I first met him — betrayed the movement. That’s Rev. James Lawson on the moment in June 1966 when Stokely Carmichael (above) unveiled his idea of Black Power. Five years earlier, during the Freedom Rides, things had been different. Nonviolence was then the dominant model, in large part thanks to Lawson himself. His Nashville workshop had created the strongest student movement in the south. It was the Nashville Movement, notably Diane Nash along with Lawson and many others, who saved the Rides after the horrific attacks in Anniston and Birmingham, AL. Stokely Carmichael was a student at Howard University in 1961, and as a Freedom Rider, any reservations he had then about nonviolence were publicly put aside, though they were certainly expressed behind bars in Parchman Prison, where he and the other Riders were locked up for several weeks. 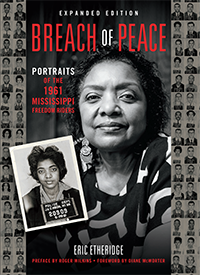 By June 1966 Carmichael had been organizing in Lowndes County, AL, for over a year, and had helped force John Lewis out as the head of SNCC so that he could replace him. Lawson had moved from Nashville to Memphis, and was now the pastor of Centenary Methodist Church. After James Meredith was shot on the second day of his solo March Against Fear (from Memphis to Jackson, MS), on June 6, 1966, Lawson along with other leaders rushed in to to fill the void, reconstituting the march with Meredith’s permission. Carmichael was part of that group, and ten days later, as the march passed through Greenwood, MS, he issued his first public call for Black Power. I interviewed Rev. Lawson in Nashville in the summer of 2007 as part of the research for my book. He visibly bristled when I used the word “radical” to describe certain events in the mid- to late ’60s. The fact that Stokely’s cry was picked up by various revolutionary elements in the country as being radical and militant, that to me is a kind of white romanticism that is not connected to the effort to create a new nation. I don’t think anything was more radical than the Montgomery bus boycott or the sit-in campaign or the Albany movement or the Birmingham campaign. Stokely betrayed us in two ways: first, he became chair of SNCC after John Lewis had already been elected and had to leave, so that’s an old, tyrannical tactic that did not become Stokely or the movement. Second, because he wanted to plant this notion of black power into the Mississippi March Against Fear, in ’66. He should have been talking to Martin as early as 1965. Stokely was getting frustrated in Lowndes County by that time. So he should have been talking to King and to others of us about all of this early on. We were his friends. We had spent time in jail together. So he should have been exploring that discussion early on, as soon as he was developing it instead of deliberately — as he admitted — injecting it into the ’66 Meredith march. On the day that [James] Meredith was shot, he didn’t have the courtesy to call me in Memphis and say, “I’m going to be on a plane Monday — the next morning, whenever this was — will you pick me up?” I picked him up, but that’s because I was picking up King. King and I had talked about continuing the march, and I picked up Martin and a couple of other people at the airport. Lo and behold, Stokely’s there with a small entourage. So I picked him up too, because I had a nine-passenger station wagon. I brought him to the house, and he didn’t say any of this in the process of that day together. The first day when we started down the highway from Hernando [in north Mississippi], where Meredith had been shot, I don’t remember Stokely raising any of this about black power. There was no media there that day. There was no media there; we hadn’t announced that we were going do it, we were doing it quietly with Meredith’s consent. I visited with Meredith the day he was shot, and he agreed that the march should not be stopped by his being shot and that some of us should do it. So we had not broken faith with Meredith over the issue. I mean, King and I saw to that. And so James received me that afternoon at the hospital, and we talked these things out; and he agreed, let’s go forward. I don’t remember Stokely ever raising it that particular day. But he claims later on that he decided there, with King, when the media came, that he was going to put this out into the world. Well, that was a fairly unfaithful way of doing it. With folk who loved him and knew him. The urban explosions that began in ’64 in Rochester, NY, as I remember, that was only Americana coming to the surface. Urban explosions and riots against black people had had a long history in the United States. So to see those as a part of the movement, I do not. An urban explosion is an urban explosion. Did the movement have an effect on them? Only in this sense: That we started the awakening of black people, and black people were saying enough is enough is enough. So that took place in ’64 the first time. I don’t consider that part of the civil rights movement but part of America. What I call the civil rights movement was the various efforts out of the NAACP, the Urban League, the Congress Of Radial Equality, the Southern Christian Leadership Conference and other such groups to deliberately plan resistance, deliberately call for the awakening of people, the reaffirmation of equality, freedom, justice, and the dismantling the segregation system. That’s the movement, and it happened in a great variety of ways. While it is always interesting to discover new pieces of oral history on the movement I think this article does a disservice to Stokely Carmichael and the Black Power movement as a whole. I would advise those that read this piece to also consult Stokely’s autobiography (Ready for revolution: the life and struggles of Stokely Carmichael, 2003) and recent revisionism that has challenged such negative interpretations of the black power philosophy that he (and SNCC) espoused. (Peniel Joseph, Waiting ‘til the Midnight Hour, 2007 is particularly useful but other authors include William van DeBurg, Jeffrey Ogbar, Simon Wendt, and Timothy Tyson). Rev. Lawson is entitled to his opinion and I think it is great that such an important figure in the movement is still willing and eager to share his views of this important period. I must, however, take issue with the notion, shared by the author, that Stokely “helped force John Lewis out as the head of SNCC so that he could replace him”. This idea that Stokely engineered a coup against Lewis is a long propagated falsehood. Firstly it is important to note that Stokely didn’t actually have any intention of running for the post, organising as he was an important program in Lowndes County, and that it was Cleveland Sellers and Ruby Doris Smith (elected as Program Secretary and Executive Secretary respectively) who pressured Stokely into running in order to better represent the evolving feelings of the field staff. (In the words of Sellers, “it was a bunch of us who argued Stokely into running.” – Carmichael and Thelwell, Ready for Revolution, p. 480). By the time Lewis was replaced as leader he had become alienated from many of the field staff he claimed to represent. While still respected immensely for his unwavering commitment to the movement his notion of philosophical nonviolence and allegiance with federal forces put him at odds with the field staff not only on Stokely’s Alabama project but also amongst staff in Mississippi. Indeed even to outside observers such as the journalist Paul Good it was obvious that “it wasn’t so much that he was losing his audience; the audience was already lost” (Paul Good, in Elliot’s Black Protest in the Sixties, p 254). Lewis’ replacement as leader represented a groundswell of opinion within SNCC at a time when the whole direction of the civil rights movement was in flux. To paint Stokely as a back handed, conniving man is to do great disservice to a remarkable individual. I knew Stokely Carmichael. I marched with him on the streets of Jackson, Mississippi decrying racial injustice by the government of Mississippi. I was beaten and incarcerated with him at the Mississippi State Fair pavilion. I saw the cops strike Stokely over and over again in the kidneys with their clubs’ T-squares. When they dragged him and Charley Cobb off the city jail, I retrieved his campaign (straw) hat. Late when I handed it to him at Steven’s Kitchen, he said: “keep it as a souvenir.” For the Brothers to denigrate him after all the sacrifice he made is pettiness of the lowest order. When I asked a black brother is he knows Stokely Carmichael, he invariably says: “The name sound familiar” or “No, I never heard of him. Rare has a black brother heard of him. All those years of brutal beatings and his own black brothers have rejected him. There would have been no Obama without the persistent courage of men like Stokely. read: Black Power: The Politics of Liberation.